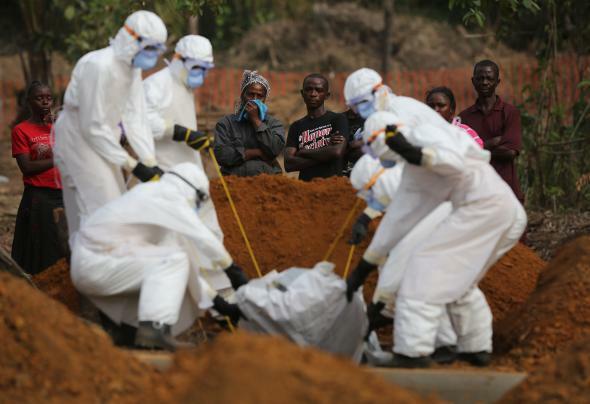 WHO announces the first West Africa Ebola-free week since March 2014. A family watches as a burial team lowers their loved one into a grave in Disco Hill, Liberia. After a year of tragic milestones of historic proportions due to the outbreak of Ebola in West Africa, this week came a landmark announcement of a different sort: Last week was the first week since March 2014 to record zero Ebola cases in the three countries at the epicenter of the outbreak. The heartening news came via the United Nations, which reported that the WHO had discovered no new cases over the last week in Guinea or Sierra Leone. Liberia was determined to be free of Ebola last month, after 42 days without a new case. The three countries accounted for almost all of the estimated some 11,000 deaths in the region due to the virus. “New cases have fallen sharply in 2015, but the WHO has warned that the disease could break out again,” the BBC reports. “More than 500 people believed to have had dangerous contact with an Ebola patient remain under follow-up in Guinea, the WHO said in a report. It also said several ‘high-risk’ people linked to recent patients in Guinea and Sierra Leone had been lost track of.” The WHO urged all parties to remain diligent and that we’re not totally out of the woods yet. In Nigeria, which escaped the brunt of the virus, and was declared Ebola-free last year, quarantined 10 people on Thursday for coming into contact with a patient with Ebola-like symptoms.